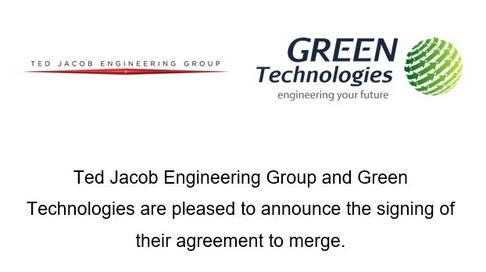 Ted Jacob Engineering Group and Green Technologies are pleased to announce the signing of their agreement to merge. Effective June 18, 2018, Green Technologies is part of Ted Jacob Engineering Group. Green Technologies Inc was established in Canada in 1997, and subsequently as Green Technologies FZCO in Dubai in 2004. The company has pioneered the implementation of Sustainability and LEED in the Middle East, delivering 665 LEED-certified buildings to date, and has been a successful specialist engineering consultancy firm providing engineering services that range from retrofitting of existing buildings and district cooling plants, improving their energy efficiency and operating performance, to developing low energy to zero energy buildings. Ted Jacob Engineering Group is an international engineering design consultancy committed to deliver sustainable design and serving customer needs through the application of innovative technologies. It was founded in 1985 in California, USA, and opened its Dubai branch in 2012 through the acquisition of a strong engineering team that has operated in the Middle East since 1970. The merger of Green Technologies into Ted Jacob Engineering Group will greatly expand and augment our team’s ability to not only continue to provide excellent service to our customers but to incorporate expertise and specialization in sustainability and implementation of LEED and Net Zero Energy design.